Guys!! Guys!!!! Guys!!!!!!!!!!!!!!!!!!!!! Fake food is on NPR. Check out this neat-o article on the salt blog- it's about Sandy Levins and her historic faux food. How cool is that!? Thanks to Sarah K. for the heads up on the article! Yes dear, but we Cantaloupe! At some point in your props career, you start to realize that certain people are hard on props-no matter how much love and effort you put into a project, once it is handed off, you know it's done for. Now, a lot of you are thinking "Yup, Actors. Why would they do that with an antique silk parasol, no one would ever do that in real life!? What do you mean you still haven't found some of the spines!?" And you'd be right, just what in blazes DID they do to that parasol?!? In the interest of fairness, however, there are also certain run crew members that I've encountered who seem to think that the best way to preset a prop is to drop kick it into place. "What do you mean you don't know how ALL of the gilded saucers broke? They were glued to the tray for F#$%'s SAKE! Why does the tray have TIRE TRACKS on it?!" Ah, the joy of the collaborative process. 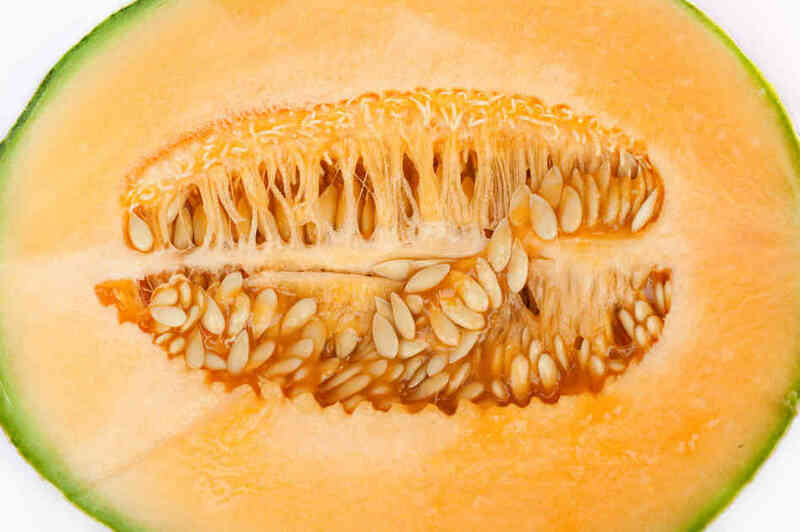 You might be wondering what this rambling has to do with melons. Well, I'll tell you! During my first season as a starry-eyed Journey-person in the prop shop at Santa Fe Opera, I was part of a large group of people that put together an entire banquet of fake food to be 'served' during our production of 'The Tempest.' On the day that the banquet was to be rehearsed, a line of props run crew and artisans marched single file our of the shop carrying silver platters laden with mounds of painstakingly arranged foods. They returned in the same single file line, minutes later, with crestfallen faces and silver platters mounded with the detritus of their torn-apart projects. 'WHAT HAPPENED!?' the rest of us cried, and Eileen regaled us all with the tale. Apparently, the director had requested that certain parts of the banquet be removed during the scene. The propsters who delivered the banquet to rehearsal explained to the entire cast that most of the food was glued down, but that items that were left unglued and could be removed had been marked with a piece of spike tape. Simple enough? No. No it wasn't. As the scene was rehearsed, the chorus rushed downstage to devour the banquet. Fruit went flying, garnishes were torn away, there was no regard for adhesive, and the entire banquet was reduced to rubble. "My favorite part" Eileen told us later "Was watching the chorus member who couldn't pick up an orange place the heel of their palm against the tray to hold it in place while they pried the glue free." Yup. Sometimes, your props are just doomed. And now, on to the crafting. This project was one of my first fake food projects, so it is near and dear to my heart.I can't really claim that I did more than help on this project, but it is still one of the most successful fake food pieces I've seen. When the canteloupe came onto my craft table, it was a carved piece of bead foam that had been coated with flex glue and cheesecloth. I was also handed a pile of seeds that had been made from paper clay. My job was to affix the seeds inside the melon, and apply a texture to the outside before handing it off to the painters. To make the texture, I used joint compound with a little bit of flex glue mixed in. Any time I use a brittle material to coat something (like joint compound or Durham's Water Putty) I like to mix in a little bit of flex glue. I think it gives it just a little bit more durability. To make the texture of the cantaloupe skin, I took a small chunk of wood, and covered it with dots of hot glue. I then dabbed this pebbled surface into the joint compound on the melon to make peaks. Once the joint compound dried, I sanded the peaks off of the melon, giving the craggy, pitted texture of cantaloupe skin. you'll notice that they are held in place by a mass of soft fibers. To recreate these fibers, I used hot glue strings. I placed the hot glue onto the walls of the seed cavity, and drew strings back and forth across the cavity with a popsicle stick to create the fibers. Once that was done, I nestled the paper clay seeds into the fibers and glued them into place. The real magic of this prop lies in the paint job. I'm pretty sure that Amy Weller could have painted a golf ball and people would have thought it was a cantaloupe. Isn't that gorgeous? I love how she really used the texture of the skin to her advantage, and I love how she focused on the texture of the seeds and the color of the rind around the edges. Really lovely work, I think. So, that's the cantaloupe! Happy Propping, y'all, and may your props be ever safe from clumsiness and idiots.